My story....so on March 7, 2009, I was skiing around some moguls, and was going pretty fast. I hyperextended my left leg, heard and felt the "POP," and then as I was falling, I also twisted my right knee. I guess that I'm lucky that all I ended up with was a completely torn ACL in my left knee, and a strained MCL in my right knee. I have found a reputable Sports Med Surgeon here in Tucson, AZ, and he recommended using my hamstring to replace my ACL. I plan to return to skiing next season, and I'm also an avid runner. I run marathons, and plan to return to this sport as well. He discouraged against the patella graft because I may notice knee pain in these sports, and strongly discouraged against the allograft because of my age and sports activities. I'm 31 years old. He reported that recent research has shown that allografts tend to stretch out over time. So, I'm going with the hamstring graft. I'm concerned about the possibility of tunnel widening (from info that I've found online) and how this could impact my sports. I'm also concerned about the function of my hamstring post-op. I'm walking ok right now, without a limp. My knee feels unsteady at times, and I've just abstained from running outside (although I CAN use an elliptical machine), and no hiking. I'm afraid that I could further injure myself. 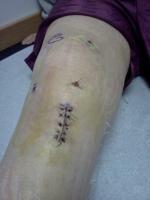 I'm just hoping that surgery is the best choice for me, and that is takes me back to my 100%, rather than downhill. I guess we all wish for that, and I wish that for everyone on here too!!! It's just a TOUGH decision to make....and finding the RIGHT surgeon is hard too. Anyways, if anyone has any further advice for me, please post on here. My surgery date is April 30th. I'm so nervous.